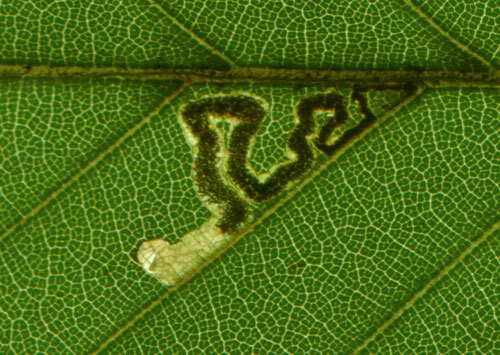 Oviposition at the underside of the leaf, in the axil of a vein. 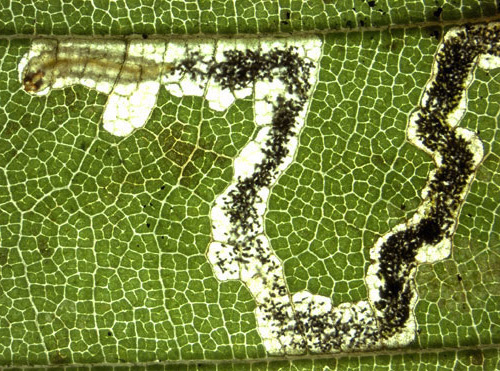 From there a corridor, that does not widen much, zigzags between two lateral veins in the direction of the leaf margin. Frass at first in a narrow central line. Later the frass becomes widely dispersed; it never lies in coils. 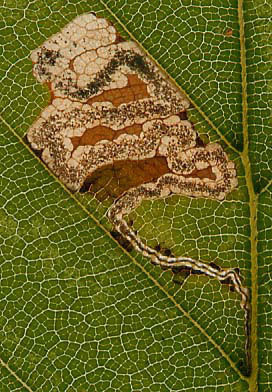 Larvae in June – July and again August – October (Emmet, 1983a). All Europe, except European Russia (Fauna Europaea, 2009). Nepticula tityrella; N. brunnensis Skala, 1939; N. turicella Herrich-Schäffer, 1855. Baldizzone (2004a), Beiger (1980a), Bengtsson (2008a), Borkowski (1969a), Buhr (1935b, 1964a), Buszko & Baraniak (1989a), Csóka (2003a), Diškus, Navickaitė & Stonis (2011a), Diškus & Stonis (2012a), Emmet (1983a), van Frankenhuyzen & Freriks (1972a), van Frankenhuyzen & Houtman (1972a), van Frankenhuyzen Houtman & Kabos (1982a), Gustafsson (1985a), Gustafsson & van Nieukerken (1990a), Haase (1942a), Hartig (1939a), Hering (1935a, 1957a), Huber (1969a), Huemer & Erlebach (2003a), Johansson ao (1990a), Klimesch (1950c, 1958c), Kollár & Hrubík (2009a), Kuchlein & Donner (1993a), Kuchlein & de Vos (1999a), A & Z Laštuvka (1997a), Maček (1999a), Matošević, Pernek, Dubravac & Barić (2009a), Michna (1975a), Navickaitė, Diškus & Stonis (2011a, 2014a), van Nieukerken (1986a, 2006a), van Nieukerken, A & Z Laštuvka (2004a, 2006a), Nowakowski (1954a), Plóciennik, Pawlikiewicz & Jaworski (2011a), De Prins (1998a, 2007a), Robbins (1991a), Schütze (1931a), Sefrová (2005a), Skala (1939a, 1941a), Sønderup (1949a), Stammer (2016a), Steuer (1995a), Szőcs (1977a, 1978a, 1981a), Tomov & Krusteva (2007a), Zoerner (1969a, 1970a).